With an abundant array of exciting activities for your children and their friends, swing set is the best option that is available in different shapes and sizes. Swing sets are made using different materials like steel, metal, plastic or wood. There are different researches and studies conducted that have arrived to a conclusion that wood swing sets are the safest, long lasting and most durable play sets available in the market. 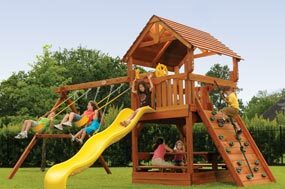 There are also some reasons that contribute in the wide usage of wood for swing play sets and especially timber redwood. Redwood is a strong timber redwood that is virtually splinter free, has natural resistance to decay and doesn't require constant coats of stains and wood preservatives for maintaining its durability as well as rich exterior color. There are numerous people, who assume that steel or metal is strongest and most durable material to use for building swing play sets but there are several reasons that support that redwood trees outlast buildings. Weather always remain a threat to a play set frame; there are different factors like year's rain, snow, high winds, excessive UV sunlight, insects and animals that can harm the metal and can also corrode the metal. Corroded metal shows rusted color and sometimes you won’t even be able to detect the weakness of the metal. Plastic is also used for constructing swing play sets as it is considered to be cheap and lightweight, but it is also under the attack from the environmental elements when placed outside. Plastic play set is considered as the best option, if it has to be placed indoors and not outdoors. Due to all these reason, wood is considered to be the best material for building strong, high quality and long lasting swing sets. There are different types of timber wood available, including white pine and redwood. Best wood to be used is redwood because it is strong and able to resist natural decay. Splinter free redwood is used for making a solid swing set frame and also ensures that your kids don’t get their clothing snagged on exposed screws and bolts or wood shards from cheaper lumber. There is another benefit that you will discover after installing redwood swing sets and that is this type of wood does not require preservatives, stains or any other exterior spray for protecting the wood. Redwood is considered as one of the most durable timbers available that can be used for years without any maintenance. Another most important benefit that you will discover through wood swing sets is that these have the ability to add different accessories in your sets like monkey bars, spiral slides and buoy swings. Metal and plastic sets are usually pre-made and come as is with no option for additions. When your child grows older and wants some exciting features except for only a glider slide then you have to buy a new play set but this is not the case with wood swing sets. With these sets, you can add different accessories as per your child’s specification and requirement.